Oranges, grapefruits and lemons, tangerines, limes and maybe even a pomelo are types of citrus fruits we eat, or juice, all the time. But how many of you are familiar with the citron? The citron has been around for thousands of years, and when crossed with other species, gave rise to the different citrus varieties we know and love today. But aside from its fragrance, the citron does not have many redeeming qualities, especially as it is almost devoid of juice and has a thick rind. While this can be candied to make succade, the citron's main uses have been religious. In the Book of Leviticus it is written: "And you shall take on the 1st day (of the Feast of Tabernacles, Sukkot) the fruit of beautiful trees...". The citron, known in Hebrew as the etrog, has always been assumed to be this fruit, as indeed the literal translation of the Hebrew word for "citrus" is eitz hadar, which literally translates as "beautiful tree". 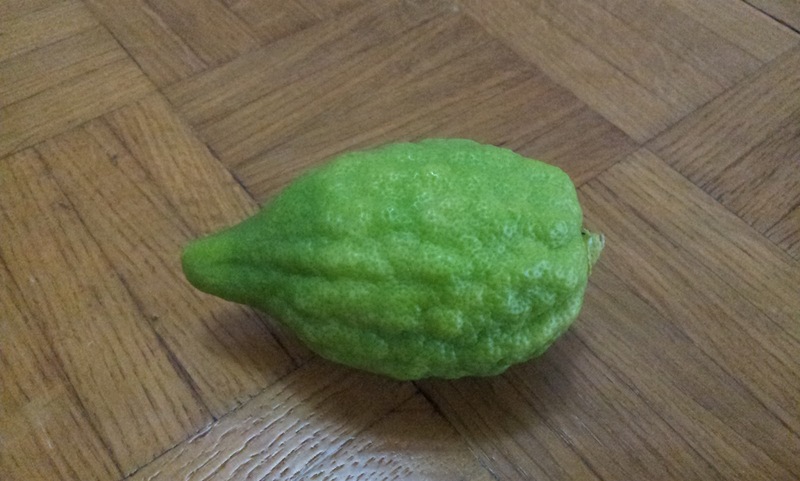 Because god commands us to use the etrog during the Feast of Tabernacles, the trade in citron, and especially beautiful unblemished fruit, can get competitive and expensive. The search for the perfect etrog was even the subject for an excellent movie, Ushpizin, which I highly recommend. I personally tried one in States... taste really good but can't find such in Singapore... Have to settle for the lesser..